As everyone who has watched the genre knows, there is a lot of female opera-singing in symphonic power metal. 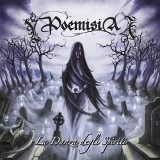 But Poemisia's debut album, La Danza Degli Spiriti, takes this to an extreme; while many symphonic metal bands are basically (sadly, often generic) metal bands with a diva fronting them, Poemisia feels more like an opera that just so happens to have a metal soundtrack. A subtle difference, surely, but the result is a record that is strangely haunting and completely without any tendency towards poppiness. The prologue is in Italian, and so is the rather powerful first track, fast-paced with a keyboard providing a tinkling counterpoint to the chugging guitars used. Unlike a number of gothic or symphonic bands, there is no male vocalist to provide harsher tones to leading lady Tina Gagliotta's vocals, the guitars and bass taking on that task themselves effectively, with guitars breaking off for a wailing solo matching her high notes every once in a while. Amnesia has a repetitive verse without a particularly interesting chorus melody, but the title track, and Our Star, despite a lot of wordless vocalizations that are rather annoying to hear (though very operatic) has a set of riffs that are dramatic and go well with the overall song. I'm not an expert on opera or a great lover of operatic vocals in metal; nonethless, I can say that Gagliotta's opera singing sounds great and fits the album very well. This extends to the lyrics; the English lyrics are decent if a little repetitive per song, and for all I know, the ones in Italian might be corny as hell, but as I can only understand a few words, they sound impressive and appropriate for vocals from a musical genre that was invented by speakers of that language. Sonata al Crepuscolo is an example of this. Completely in Italian, the music is quiet and showcases the vocals primarily until guitarist Marco Monaco kicks in with a solo that matches the previously sung lines. It's a dramatic, powerful song and I loved it. The Innocence of a Dead Child, on the other hand, is more of a mixed bag. The melody is great and the band plays this tightly and with lots of enjoyable bombast -- but Gagliotta drops her opera singing for a large portion of this track and exchanges it for something that sounds more like the harpy screech of Alanis Morissette. Luckily she reverts partway through the track. The last track finally gets a male singer for a bit of a duet, and a famous one in the metal world -- Sakis Tolis from Rotting Christ does the guest vocals! Come to think of it, the darkly poetic nature of Poemisia makes this unlikely match a very good one, and neither Tolis nor Gagliotta disappoint as his evil croaks counterpoint her high, trilling calls on the chorus. La Danza Degli Spiriti is not your average symphonic goth metal band, but some people will still find it hard to get into, especially if opera is not one's cup of tea. However, a listen all the way through might change one's mind. This is goth metal of the non-Hot Topic variety, and I have rarely seen an album in this genre with so much opera and still such a genuinely dark sound.